"Good posture" redirects here. For the film, see Good Posture (film). A good posture refers to the "three natural curves [that] are present in a healthy spine.". It is also called neutral spine. Looking directly at the front or back of the body, the 33 vertebrae in the spinal column should appear completely vertical. From a side view, the cervical (neck) region of the spine (C1-C7) is bent inward, the thoracic (upper back) region (T1-T12) bends outward, and the lumbar (lower back) region (L1-L5) bends inward. The sacrum (tailbone area) (S1-S5 fused) and coccyx (on average 4 fused) rest between the pelvic bones. A neutral pelvis indicates the anterior superior iliac spines and pubic symphysis fall in the same vertical line. The word posture comes from the Latin verb ponere, which means "to put or place." The general concept of human posture refers to the "carriage of the body as a whole, the attitude of the body, or the position of the limbs (the arms and legs)." Webster's New World Medical Dictionary defines neutral posture as the stance that is attained "when the joints are not bent and the spine is aligned and not twisted. Neutral posture has given rise to the idea of achieving ideal posture. Ideal posture indicates proper alignment of the body’s segments such that the least amount of energy is required to maintain a desired position. The benefit of achieving this ideal position would be that the least amount of stress is placed on the body’s tissues. In this position, a person is able to completely and optimally attain balance and proportion of his or her body mass and framework, based on his or her physical limitations. Good posture optimizes breathing and affects the circulation of bodily fluids. Stiffness of ankle joint: The stiffness model was first introduced by Winter et al., in 1998, and states that simple stiffness of ankle muscles account for the control of balance during quiet standing. The stiffness of the ankle muscle was determined experimentally by summing up the moments (or torque) left and right about the ankle and dividing it by the sway angle (angle at which the center of mass is displaced from the center of pressure). It was found in both analytical and experimental data (using human subjects) that there was a linear relationship between moments about the ankle muscle and sway angle. Additionally, the stiffness (i.e. total moment divided by sway angle) was found to be very close to 1, indicating a resemblance between the ankle joint and a perfect spring. Moment arm of ankle muscles: The moment arm of ankle muscle hypothesis for postural stability was first developed in 1993 by Young et al. and has been primarily seen in cats, though it is speculated that such mechanisms may also exist in humans. Results obtained from Young et al. showed that in the cat ankle joint, many of its muscles have predominant moment arms about the adduction/abduction axis. Smaller moment arms are found in inversion/eversion and about the principal axis of motion, dorsiflexion/extension. Additionally, Young et al. showed that the magnitudes of the moment arms in abduction/adduction and inversion/eversion strongly depended on joint angle. As the joint angle moved increasingly away from the neutral axis, the magnitude of the moment arms also increased. Such a finding suggests that, at least in cats, the coactivation of these agonist-antagonistmuscles is used for immediate stabilization in posture. Proprioception: Proprioception means "sense of self". In limbs, proprioceptors are sensors that provide information about joint angle, muscle length, and tension, which is integrated to give information about the position of the limb in space. For postural stability, it has been suggested that stretch receptors may contribute to immediate stabilization in posture. However, researchers have found a weak correlation between muscle length and ankle joint angle, indicating that the stretch reflex is probably not the main contributor to postural stability. Additionally, there is approximately a 30 ms time delay between any stretch receptor response to a change in muscle length, which further supports the idea that stretch receptors may not have a big contribution to postural stability. However, this should not rule out the role of all proprioceptors in maintaining postural stability in humans. While these are the three leading hypotheses, of course there is always a possibility that there is a combination of all mechanisms that ultimately allows humans to maintain postural stability during quiet standing. Additionally, it is important to keep in mind that there are also many physiological factors such as weight, internal noise to muscles, etc. that may come into play when trying to understand the factors that contribute to postural stability. In medicine and occupations concerned with physical fitness, the concept of good posture is referred to as "neutral spine." In this context, proper posture or "neutral spine," is the proper alignment of the body between postural extremes. Deviations from neutral alignment are identified as excessive curvature or reduction in curvature. Rarely do these deviations in curvature occur in only one plane; however, they are typically referred to in this manner. In the anterior/posterior view, deviation from vertical results in abnormal lateral curvature of the spine called scoliosis. 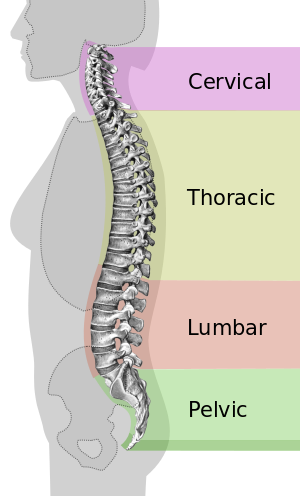 In the sagittal view, excessive curvature in the cervical region is cervical lordosis, in the thoracic region thoracic kyphosis, and in the lumbar region lumbar lordosis. Reduction in curvature is typically termed flat back if present in the thoracic region and lumbar kyphosis if present in the lumbar region. In posture analysis, the spine is compared to a plumb line to detect the aforementioned abnormalities. From the anterior/posterior view this plumb line should run vertically down the midline of the body dividing it symmetrically into right and left halves indicating even weight distribution on left and right sides. From the sagittal view the plumb line should bisect the ear, odontoid process of C2, the cervical vertebral bodies, the center of the glenohumeral joint, the lumbar vertebral bodies, the center of the acetabulum, just posterior to the patella, and through the tarsals of the feet. This sagittal line of reference theoretically indicates even distribution of weight between the front and the back of the body. Scoliosis is well established and even evaluated at an early age. It is typically quantified using the standardized Cobb angle method. This method consists of measuring the degree of deformity by the angle between two successive vertebrae. The Cobb method was accepted by the Scoliosis Research Society (SRS) in 1966. It serves as the standard method for quantification of scoliosis deformities. Sagittal plane posture aberrations such as cervical and lumbar lordosis and thoracic kyphosis have yet to be quantified due to considerable inter-individual variability in normal sagittal curvature. The Cobb method was also one of the first techniques used to quantify sagittal deformity. As a 2D measurement technique it has limitations and new techniques are being proposed for measurement of these curvatures. Most recently, 3D imaging techniques using computed tomography (CT) and magnetic resonance (MR) have been attempted. These techniques are promising but lack the reliability and validity necessary to be used as a reference for clinical purposes. Chronic deviations from neutral spine lead to improper posture, increased stress on the back and causes discomfort and damage. People who sit for long hours on the job are susceptible to a number of misalignments. "Neutral spine" is ideally maintained while sitting, standing, and sleeping. ^ Winter D.A. ; Patla A.E. ; Rietdyk S.; Ishac M.G. (2001). "Ankle Muscle Stiffness in the Control of Balance During Quiet Standing". Journal of Neurophysiology. 85 (6): 2630–2633. doi:10.1152/jn.2001.85.6.2630. PMID 11387407. ^ Young, R.P., G.E. Loeb. "The distal hindlimb musculature of the cat: multiaxis moment arms at the ankle joint". Exp Brain Res (1993) 96:141-151. ^ Bloem B.R. ; Allum J.H.J. ; Carpenter M.G. (2000). "Is lower leg proprioception essential for triggering human automatic postural responses?". Exp Brain Res. 130 (3): 375–391. doi:10.1007/s002219900259. PMID 10706436. ^ Bloem B.R. ; Allum J.H.J. ; Carpenter M.G. ; Verschuuren J.J.G.M. ; Honegger F. (2002). "Triggering of balance corrections and compensatory strategies in a patient with total leg proprioceptive loss". Exp Brain Res. 142 (1): 91–107. doi:10.1007/s00221-001-0926-3. PMID 11797087.